Poloninu : for mandolin orchestra / Stephen Lalor. Poloninu is an energetic, pulsating piece based around two ancient folk melodies: I came up to the Plateau Field, from west Ukraine, which is heard in various forms throughout the first half of the piece, and a Moldavian dance in the second half. Interspersed between these sections are passages of playful dialogue between instrument sections and soloists. First performed as a mandolin ensemble piece by Plektra in 2010, it was re-worked for mandolin orchestra in 2014. 20 May 2017: at Lalor and Plumb in concert (Boite World Music Cafe). Featuring Luke Plumb, Shannon Birchall, Stephen Lalor. 14 Sep 2013: at Eurofest (Ararat Park). Featuring Plektra Mandolin Ensemble. 7 Apr 2012: at Volatinsky Trio @ National Folk Festival (Exhibition Park in Canberra). Featuring Lucy Voronov, Anatoli Torjinski, Stephen Lalor. 6 Apr 2012: at Volatinsky Trio @ National Folk Festival (Exhibition Park in Canberra). Featuring Lucy Voronov, Stephen Lalor, Anatoli Torjinski. 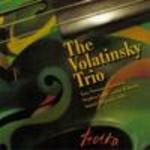 5 Feb 2011: at The Volatinsky Trio (Blacktown Arts Centre). 6 Jun 2010: at Eurofest Zupfmusik 2010 (Holzmarkt Bruchsal).